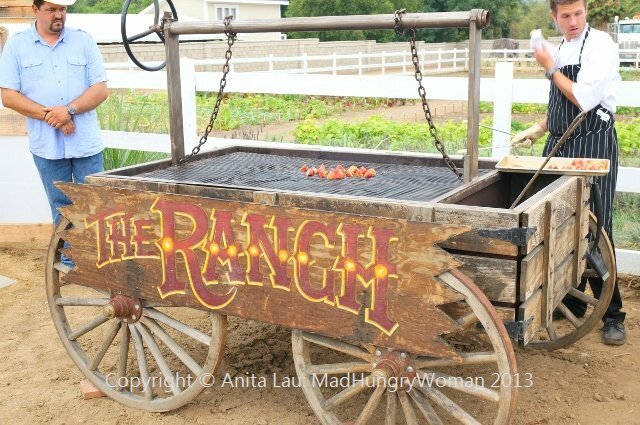 Last summer, I was invited to a luncheon on the Edwards Ranch Estates, owned by Andrew Edwards, the man behind The Ranch Restaurant & Saloon in Anaheim. It was the media event of the year and I couldn’t stop talking about it. Several months later, I celebrated my birthday at the restaurant and soon after, it was no surprise they made it onto my top 10 pick of 2012. 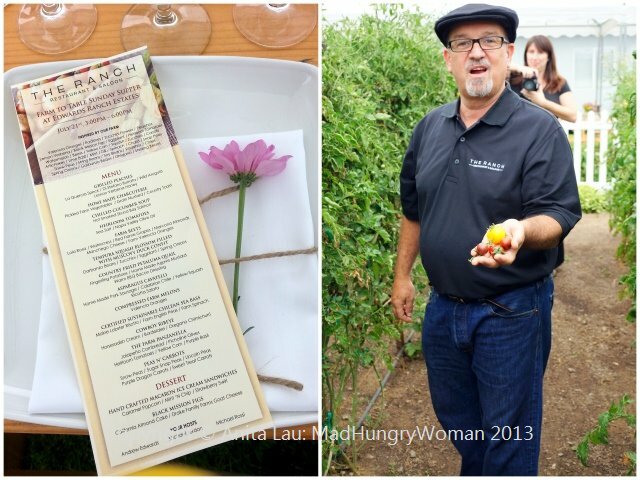 Since then, I have been patiently anticipating this annual farm-to-table event, and a couple of weekends ago, that day arrived! The weather cooperated this year. Instead of the unbearable heat of last year, we were graced with cool conditions and an overcast sky, perfect for a tour around the farm before sitting down for the incredible meal ahead. Master sommelier Michael Jordan led us on an exclusive tour, around the grounds, featuring a host of tomato varietals as well as other fruits and vegetables customers dine on every night at the restaurant. As we made our way back to take our seats at the table, I sneaked back to catch a glimpse of the behind-the-scenes magical prowess of Executive Chef Michael Rossi and his team. This setup is nothing like the state-of-the-art kitchen they cook in every night at the restaurant. 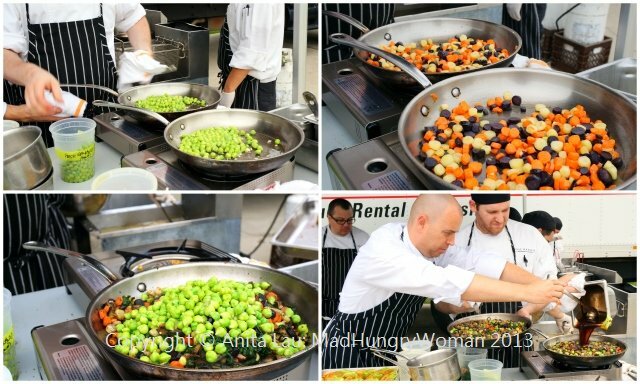 It is no easy feat to create an exquisite feast for 40 people around familiar surroundings, but here, they are only equipped with the basics — some burners and fryers under a makeshift tent. The first dish to grace our table was Grilled Peaches, something I recall from last year’s spectacular meal. 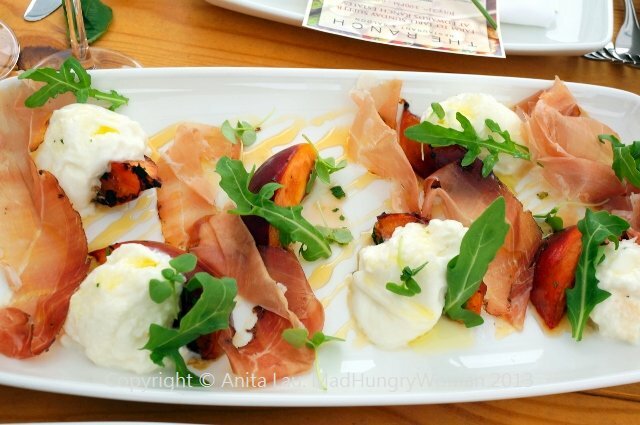 La Quercia Speck, Di Stefano Burrata, wild arugula and lemon verbena honey shared space with the intense sweetness of the peaches. I had to mentally remind myself not to take a second helping because I knew there would be tons of food coming. When the second dish arrived, there were oooos and ahhhs across the table. Home Made Charcuterie consisted of everything house-made. The beautiful pickled farm vegetables are all — you guessed it — fresh from the farm and are still crunchy with the perfect balance of acidity. 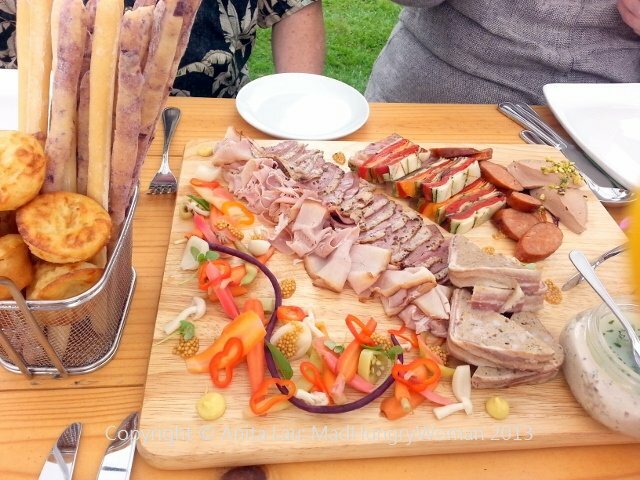 The charcuterie included Andouille Sausage, Garden Vegetable Terrine, Applewood Smoked Ham, Country Pate, Truffled Chicken Liver Mousse, Rabbit Rillette, Duck Pastrami, and although everything was delicious, my favorites were the latter three. The richness of the mousse was undeniably addicting, while rabbit rillette was simply sublime. 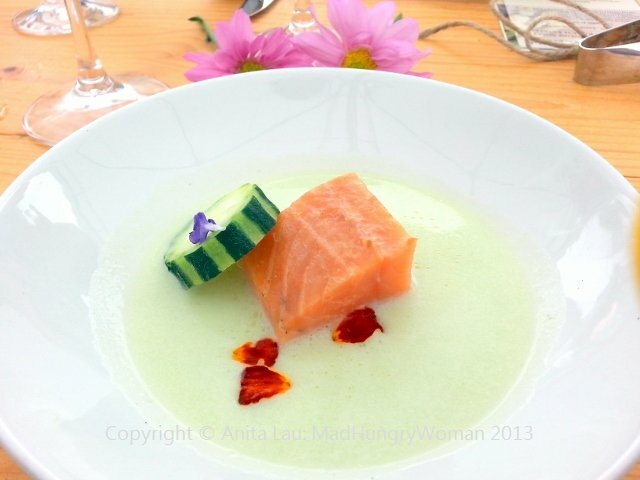 The second course was a Chilled Cucumber Soup which I also remember from last year. A tender piece of hot smoked Skuna Bay salmon sits in a bath of the delicate soup, never overpowering the simple nuances of the other. The beauty of fresh tomatoes can only be rivaled by its taste. 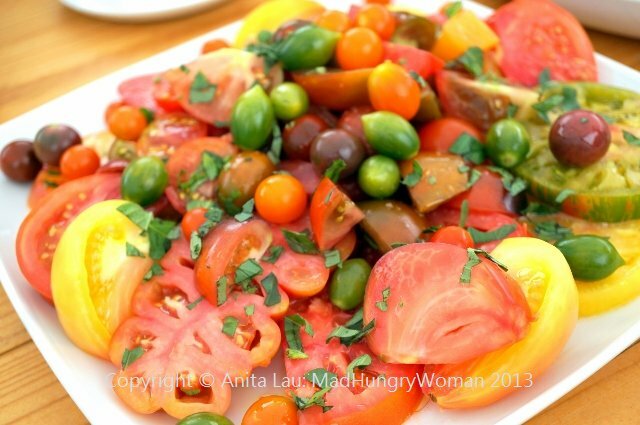 What better way to showcase Heirloom Tomatoes than to allow them to shine on their own? A touch of Maldon sea salt with a drizzle of Napa Valley olive oil were all these lovelies needed. Each variety has its own distinctive aromas and textures which you have to experience on your own. No description can do this justice. I’m a huge fan of beets and Farm Beets was right up my alley. 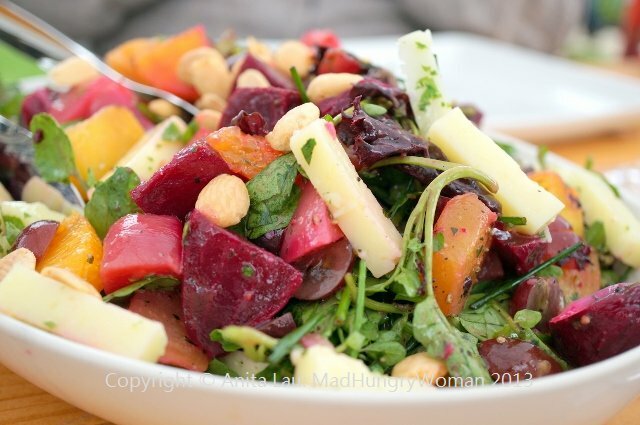 There were several different types of beets, tossed with Lola Rosa lettuce, watercress, red flame grapes, Marcona almonds, Manchego cheese and farm Valencia oranges. 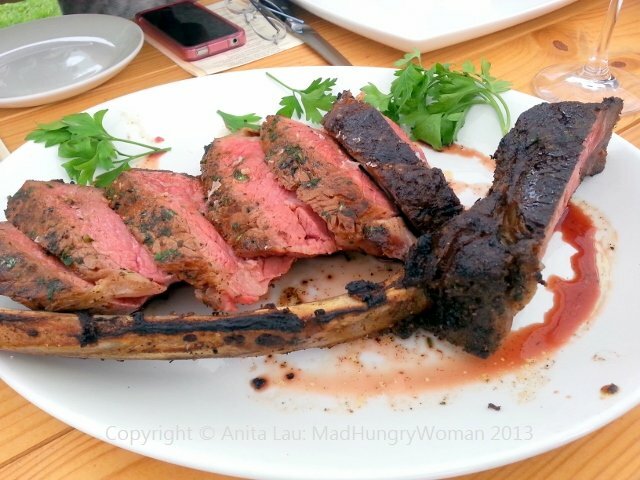 The different textures melded together for that perfect mouthful of sweet, tart and salty. 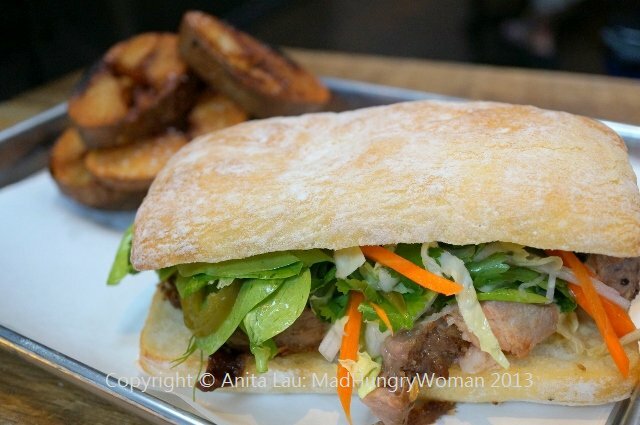 I love the restaurant’s Muscovy duck confit and when I saw this on the menu, my eyes lit up. Tempura Squash Blossom Filled with Muscovy Duck Confit was a different take on the duck I’m used to. The meat is shredded and stuffed into tender squash blossoms and lightly fried. 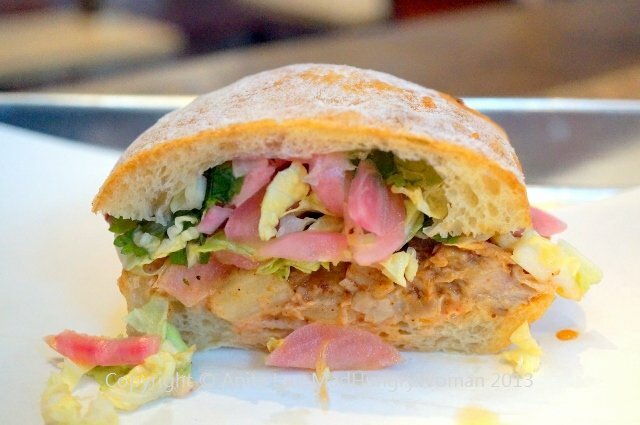 If the blossoms were meant as a vehicle to hold the confit, then it served its purpose. As two equal accompaniments, the fragile flower was overpowered by the robust nature of the duck. But that was not all. Under these was a concoction of garbanzo beans, zucchini, eggplant, spring onions in the form of a ragu. 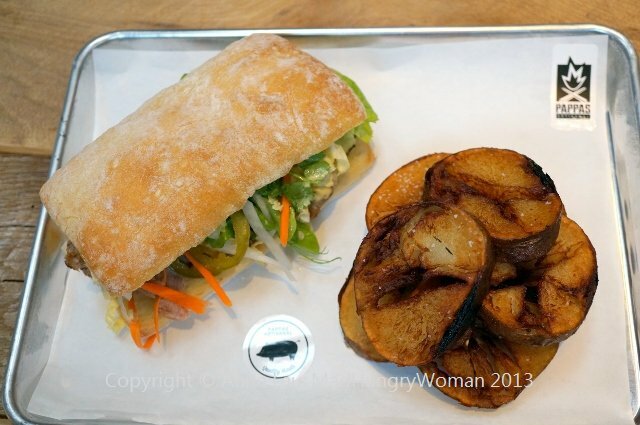 How could vegetables be this tantalizing? I couldn’t stop eating it! 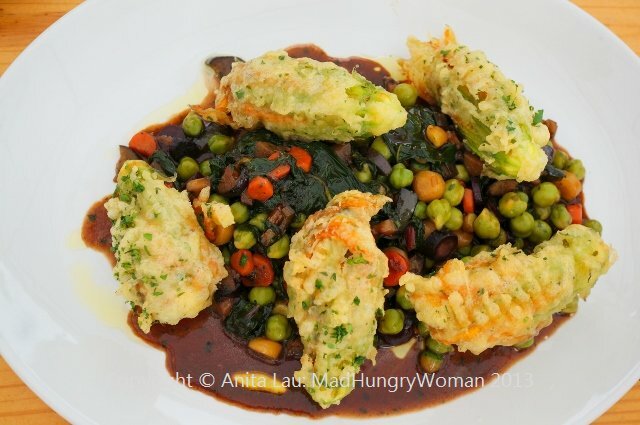 The little pods of vegetables were braised in a rich duck reduction and decadent enough as a meal of its own. It blew me away and you know it takes a lot to impress me! 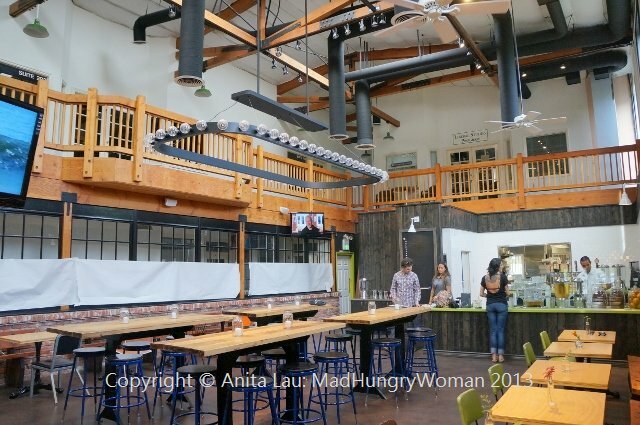 One of my all-time favorites is Country Fried Petaluma Quail and Chef Rossi admits it is one he is not able to take off the menu for fear of customer riots. Once you have a taste, you will understand why. 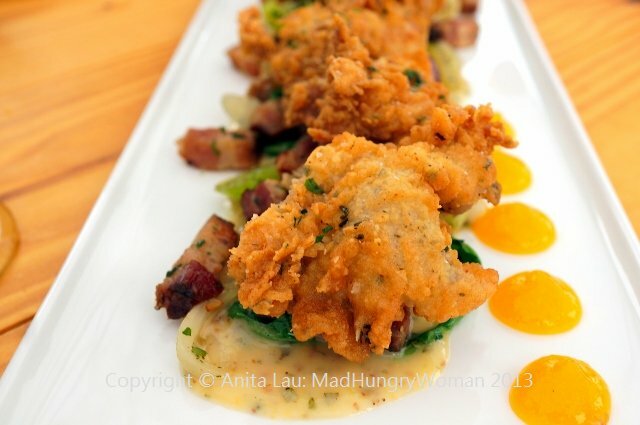 Boneless quail pieces are lightly battered with bits of farm dried sage for a heady and tasty finish. 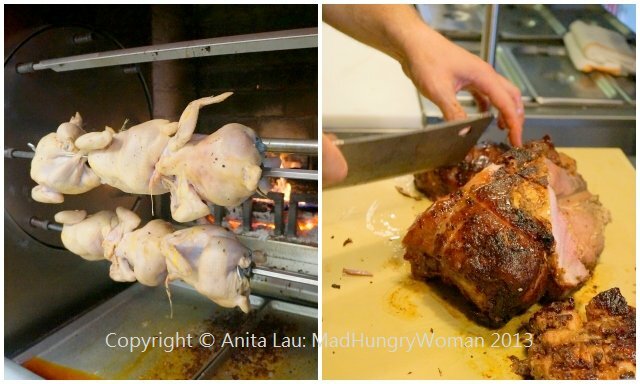 The fowl is oh so juicy and tender making it difficult for me to stop at just one piece. The accompanying fingerling potatoes with home made agave mustard and warm BBQ bacon dressing are good accoutrements, but I didn’t need any of it since the quail is always my shining star. 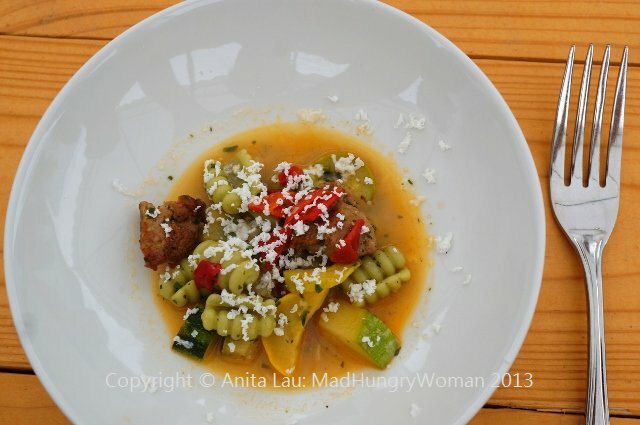 A new addition this year was Asparagus Cavatelli, (found on the restaurant’s tasting menu) with a home-made pork sausage with Calabrian chile, yellow squash and ricotta salata in a light broth packed with umami. The cavatelli pasta made in-house is perfectly al-dente and with the flavor-filled broth, I didn’t even need any of the other accompaniments to make this one of my new favorites. It is hard to believe that after all that we’ve eaten, we’re only a little over half way done. At this point, Executive Pastry Chef David Rossi graces us with a palate cleanser of Compressed Farm Melons in a Valencia orange soup. 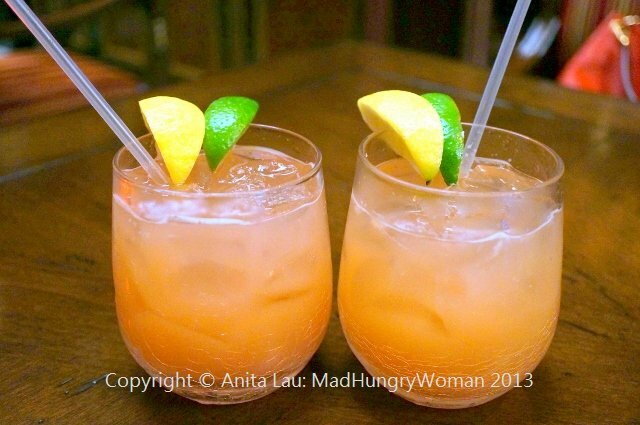 Refreshing citrus and nectar-sweet melons meld together resulting in a creation I am happy to end my meal with, but wait….. there’s more! 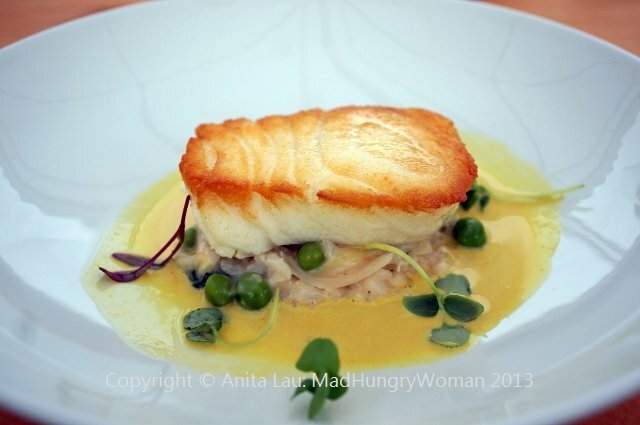 My stomach is whispering “no more”, but my mouth salivates at the sight of Certified Sustainable Chilean Sea Bass. Michael Jordan, announces we do not have to finish this entree size portion of melt-in-your-mouth sea bass, but seriously? The Maine lobster risotto it was resting on proved to be my weakness. 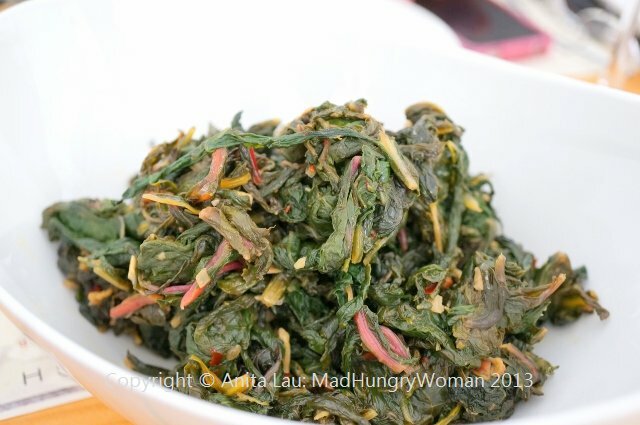 Dotted with farm English peas and farm spinach, I took a deep breath and managed to savor most of it. Unfortunately, I was only able to put away a third of the fish before reluctantly letting it go. It was a sad moment indeed. The Farm Panzanella, served as one of the remaining side dishes was vibrant and rustic in both presentation and taste. 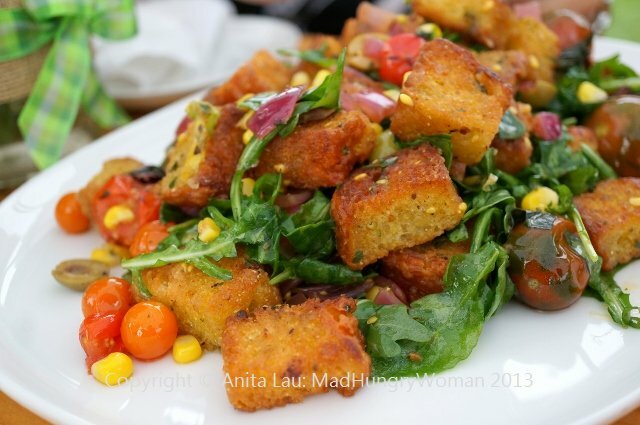 Generous chunks of jalapeno cornbread from Dean Kim’s OC Baking Company is tossed with picholine olives, heirloom tomatoes, yellow corn and purple basil is respectable enough as a vegetarian meal. 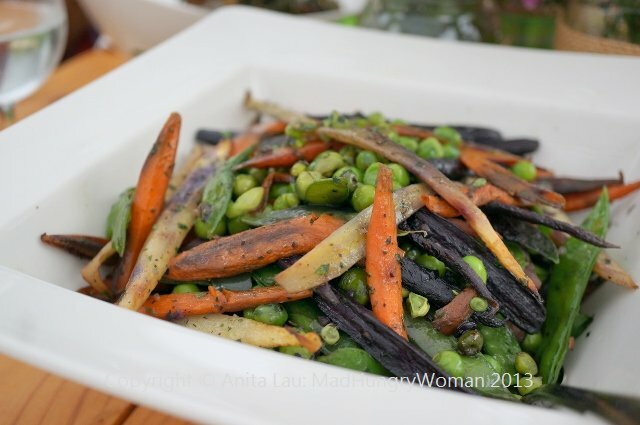 If you had room for the other sides, there was a delightful Peas N’ Carrots bowl filled with snow peas, sugar snap peas, Lincoln peas, purple dragon carrots and, sweet treat carrots. Or, just a simple sauteed Swiss chard. 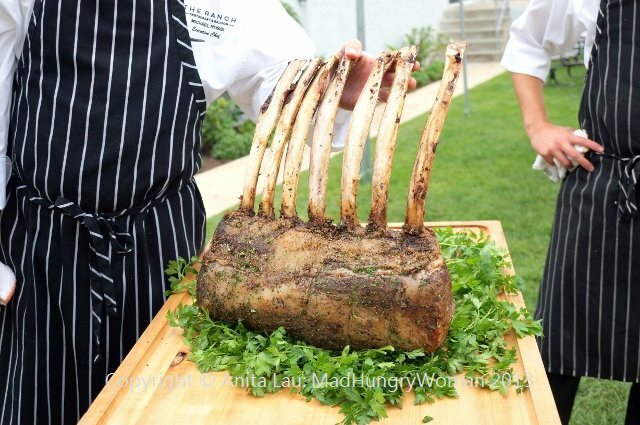 However, everyone was eagerly anticipating the Cowboy Ribeye and when Chef Michael brought it out in its entirety, the crowd jumped up to capture this on camera. One of my friends, who saw the photos, exclaimed “damn! that could have been from one of Andrew Edwards’ horses” — yes it was THAT big! In all honesty, I should have stopped eating, but I didn’t. I even had three bites to accompany each of the three sauces it was served with: horseradish cream, bordelaise, oregano chimichurri. Looking around the table, I knew everyone was floored by the almost four hours of unrivaled hospitality they had just experienced. When Andrew and Morgan Edwards host a party, you can be sure they are going ALL out from beginning to end. Last year, I hadn’t left a spot of room to even nibble on the desserts by master David Rossi, so this year, I promised to leave a speck in my belly for it. Black Mission Figs with California almond cake and Drake Family Farms goat cheese was light and luckily, a small portion. I took a bite and waited for the next. 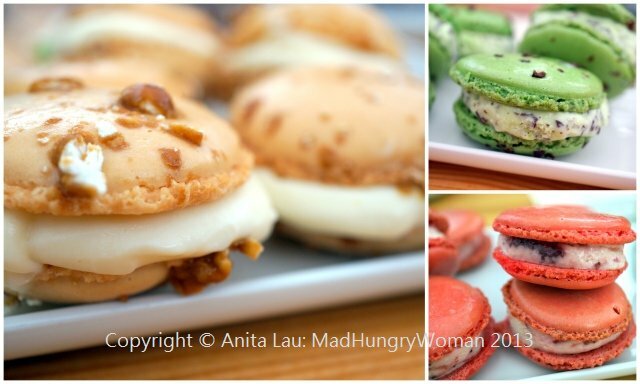 A huge smile came to my face when I saw Hand Crafted Macaron Ice Cream Sandwiches. As much as I don’t have much of a sweet palate, I definitely AM an ice cream fiend. Caramel popcorn, strawberry and mint n chip adorned the platter, but there was no denying my choice! My favorite ice cream flavor was screaming at me and yes, I ate the entire thing, and even a bite of my neighbor’s strawberry. My ‘glorious glutton’ moniker was pushed to its limits that day and even I had to admit defeat. For the next 36 hours, I consumed barely anything other than fruit and water, but it was well worth it! The 2013 debauchery might be over, but just like last year, I relish with glee counting down to what 2014 has in store for us. 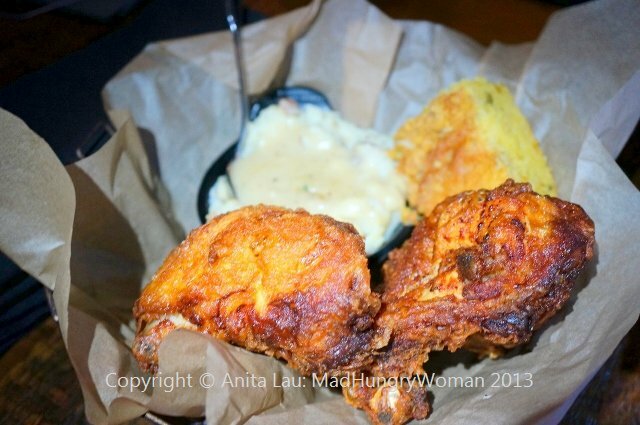 In the meantime, don’t you think it’s time you paid The Ranch Restaurant & Saloon a visit? I’ve been meaning to visit DivBar since it opened a year ago and never went until recently. Then, I had two opportunities to experience DivBar in one week. First was with a group of friends at the restaurant, and second time, we picked up dockside while on a pontoon ride on the bay. I am familiar with Chef Kris Kirk from his days back at ECCO and was excited to try his menu at DivBar. We started with a bunch of cocktails before launching into the great bites on offer. 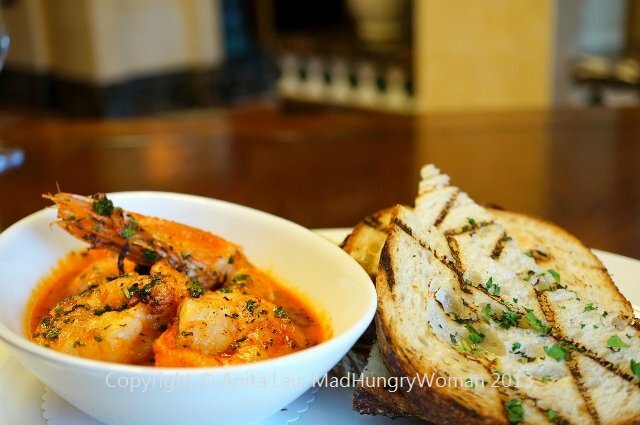 Chef Kris’ Firecracker Grilled Shrimp ($14.95) was one of my favorites. Spicy BBQ shrimp were really good. I loved these so much I actually requested them on our boat ride. Served with shishito peppers and hot sweet corn relish, it makes a great appetizer to share, or a light entree for one. 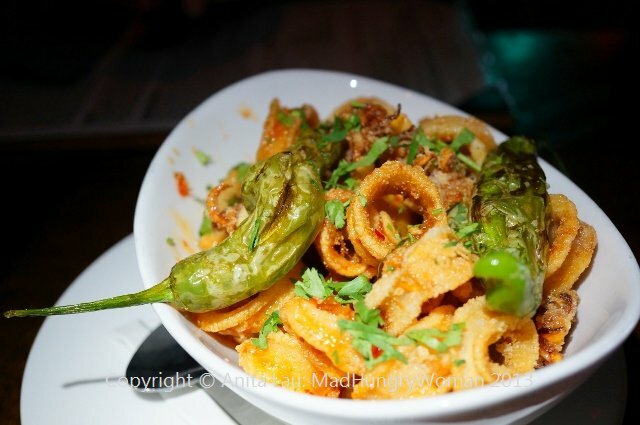 Everyone at the table loves calamari and the Crispy Calamari ($10.95) here nice and crispy with a lightly sweet chili lime sauce coating. They serve the sauce separate for the boat ride and I suggest you enjoy these at the restaurant because dipping them into the sauce is not quite the same as having them serve it tossed and hot at the table. 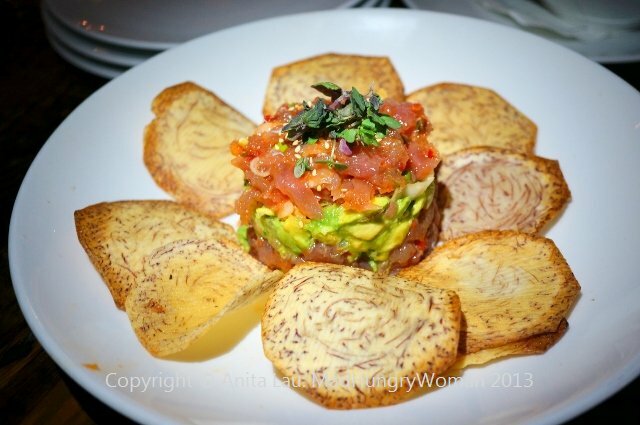 I loved the Ahi Poke ($14.95) with a delicious avocado salsa and hints of sesame oil. The use of taro chips was really unique and a nice change from the usual. When I saw DB’s Smoked Duck Fries ($7.95) on the menu, I knew I wanted them. 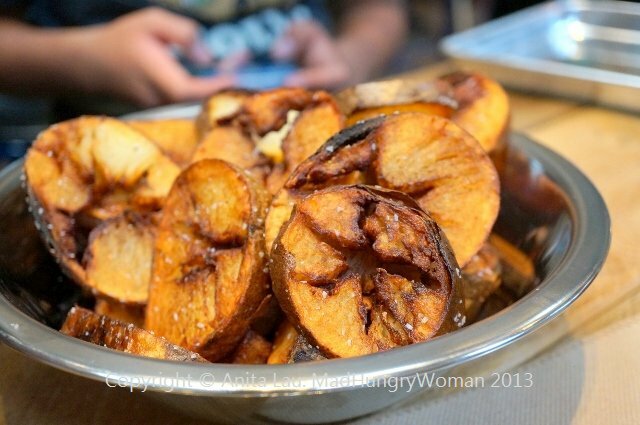 They weren’t exactly fries, but more like crispy home fries. 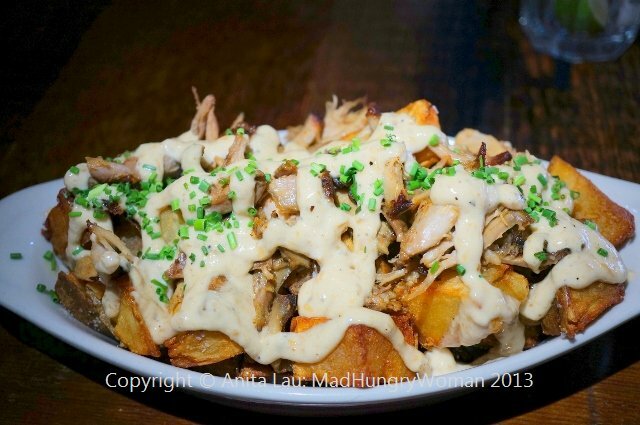 The duck was flavorful and the shallot aioli made the whole dish come together. I would’ve liked the fries to be smaller pieces as some of them weren’t crispy enough. And, who doesn’t love mac n cheese? 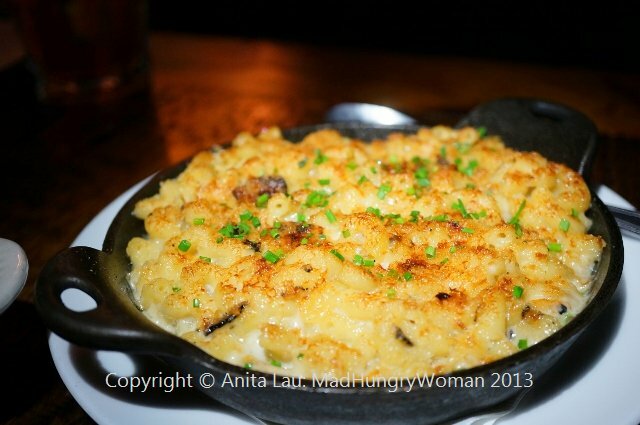 We shared the Macaroni and Cheese ($8.95) made with Taleggio cheese, dotted with crushed truffles and a parmesan bread crumb crust. 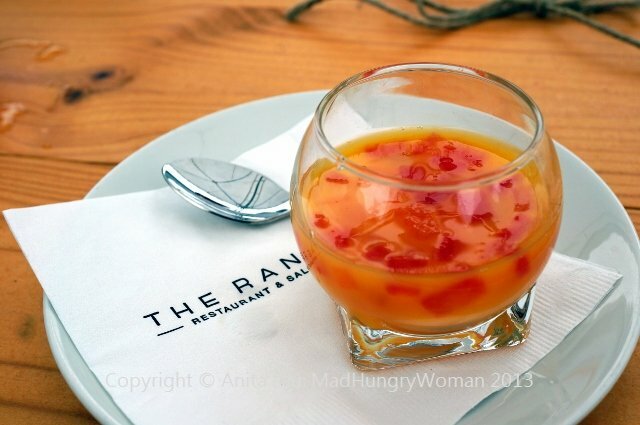 Beautiful flavors, rich, creamy and something I would absolutely order again. Now, I probably wouldn’t crave a salad when I come to a joint like this, but the Thai Chicken Salad ($12.95) was seriously good. It was a huge portion, which I doubt I could finish on my own even as an entree. Marinated chicken breast, cashews, crispy wontons all tossed in a ginger dressing — like a Chinese chicken salad, but without the strong sesame oil throughout. Everyone enjoyed this! We got some for the boat ride too! My favorite of all — on both occasions — was the DJ’s Broasted Chicken ($13.95). This is the perfect item to order for a boat ride because it travels so well. Even after an hour, the chicken still retained its crispiness on the outside and moistness on the inside. Accompanied by smashed potatoes and country chicken gravy and jalapeno corn bread (see below for more) I can positively say, this is some of the best chicken I’ve had in a long time! If you have kids, or are just a pizza lover in general, you can’t leave without ordering one of their pizzas. Thin crust pizza — again, perfect boat ride food — is the only pizza I’ll eat. 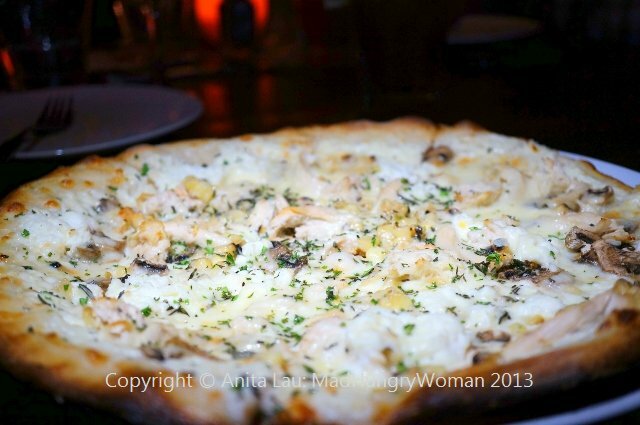 White Chicken ($13.95/10 inch or $22.95/18 inch) pizza topped with chicken, mushroom, corn, ricotta, mozzarella was one of my faves. 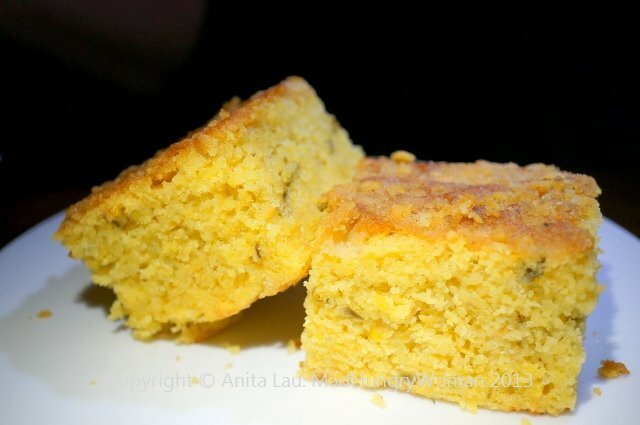 And don’t forget to taste the Jalapeno Corn Bread ($3.95) because it is quite addicting! I like mine slathered with butter! After two very successful experiences with DivBar, I’ll have to say this is a winner in my book. Come with friends to best experience this dock side restaurant. Take advantage of the valet parking or park in a lot one street up from the restaurant, it is well worth it! 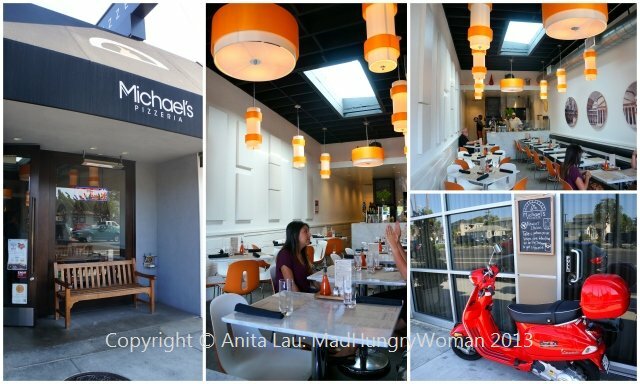 I’m always on the look out for great pizza and Michael’s Pizzeria in Long Beach has long been on my radar, but I’d never had the chance to visit. 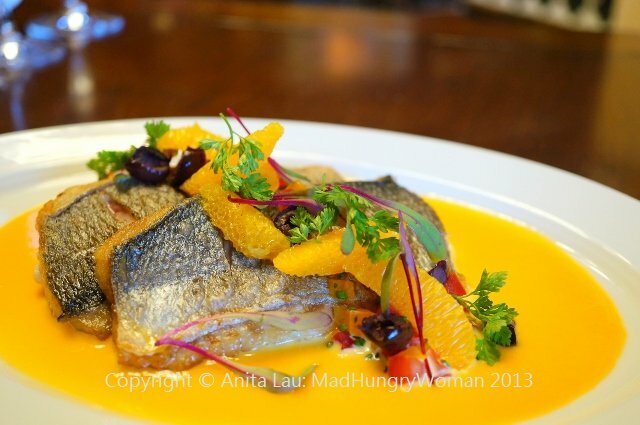 Recently, I came with my son for dinner and found the restaurant really delightful and filled with my favorite color, orange. I was really surprised to find a full menu here since I had always thought it was predominantly a pizza place. Seeing all these items made me want to eat so many things and I was glad I had my hungry teenager with me. 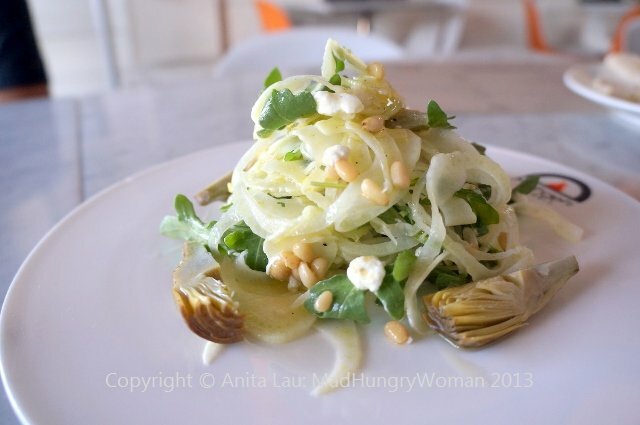 We started with Insalata di Finocchi ($9) a shaved fennel, confit artichokes, goat cheese, pine nuts and arugula salad. I love fennel so I absolutely loved it. 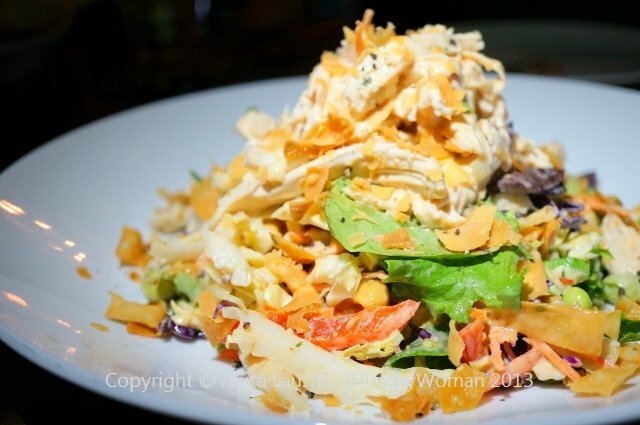 The salad was dressed lightly with olive oil and possibly a touch of lemon juice which is always welcoming. I dislike salads with too much dressing or, with chunky dressing weighing down the star on the plate. 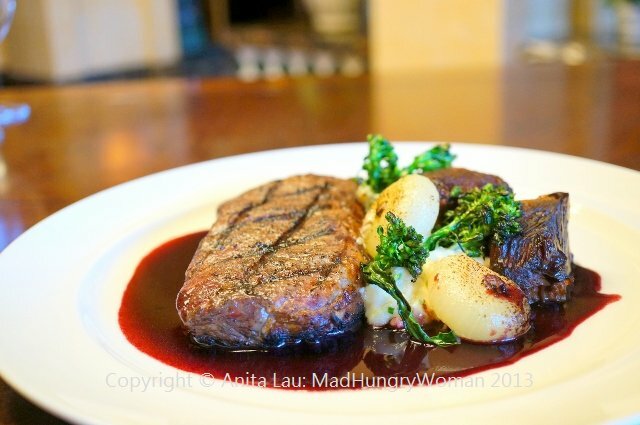 Anatra ($15) was eagerly relished by my son. 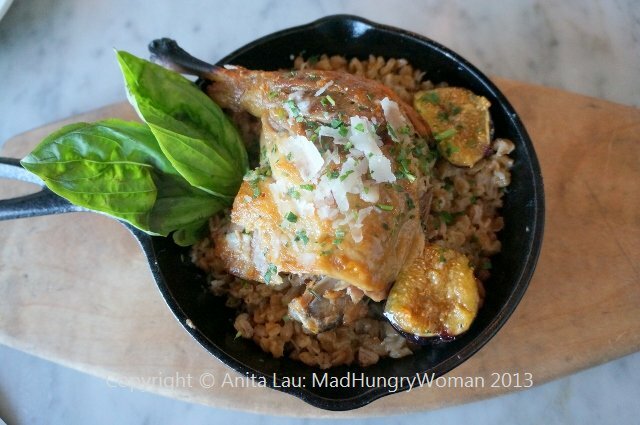 Confit duck roasted in the wood fire oven with farro and figs was just delectable. The duck was incredibly tender, falling off the bone with barely a touch of the fork. The farro provided a nutty flavor with perfect contrasting textures, and the figs added a touch of sweetness. This was seriously good! My son wanted more, but alas, I was not able to indulge him since we had more food coming. I was excited to try the pizzas here so we decided on Prosciutto e Arugula ($16), two of my son’s favorite items together on the pie. The thin crust pizza was a tad too wet from the tomato and mozzarella, but the flavors were perfect. 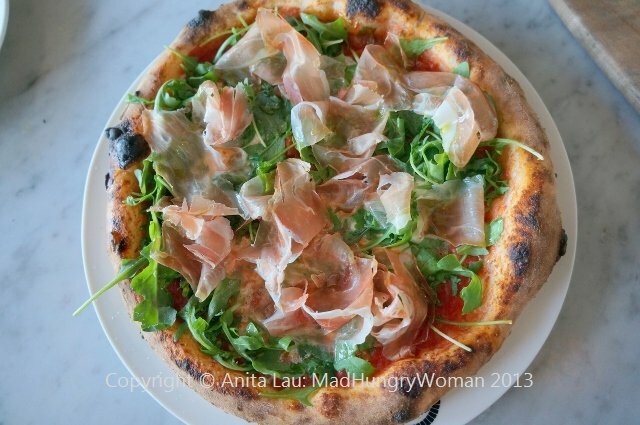 The salty Parma prosciutto married together very well with the fresh arugula for a lovely tasting pizza. The Salsiccia e Papini ($15) was my pick. 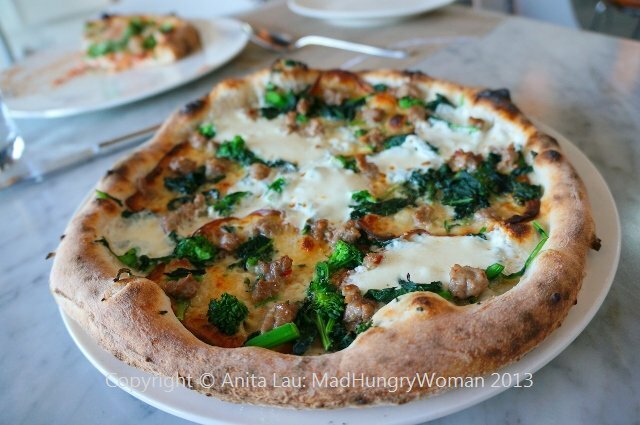 Smoked mozzarella, sausage and rapini brought mouthful after mouthful of pleasure. The smoked mozzarella was outstanding. 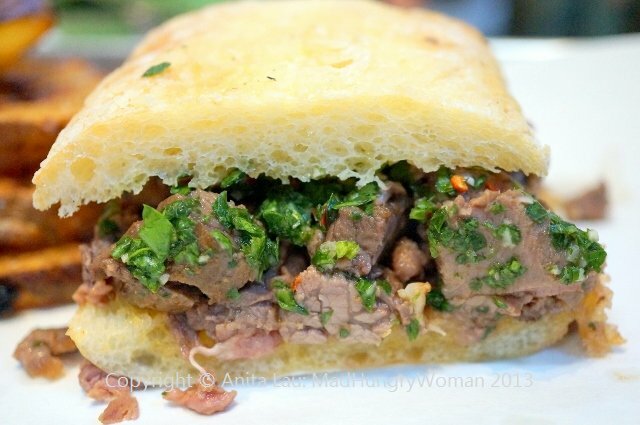 I loved the light smokiness with the great saltiness — yes I love salt — and a burst of the slight crunch from the rapini. This is going to be my pizza when I return again (my son’s been bugging me already to go back)! I wanted to try the Calzone Classico ($13) because I generally am not a fan due to the thickness of the crust. This was nothing like the ones I’ve encountered in the past. 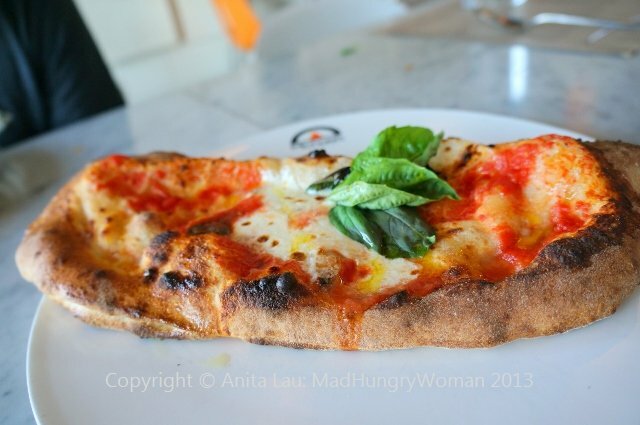 The lightness of the crust folded over the melting ricotta, mozzarella and prosciutto cotto. Topped with tomato and a little sprinkle of cheese, this is the best calzone I’ve ever had in California! We didn’t finish the pizzas obviously because not only did I want something to savor the following day, but I also wanted to try some of the desserts on the menu. I’m not a sweets fan, but Affogato ($7) is something I can never resist. 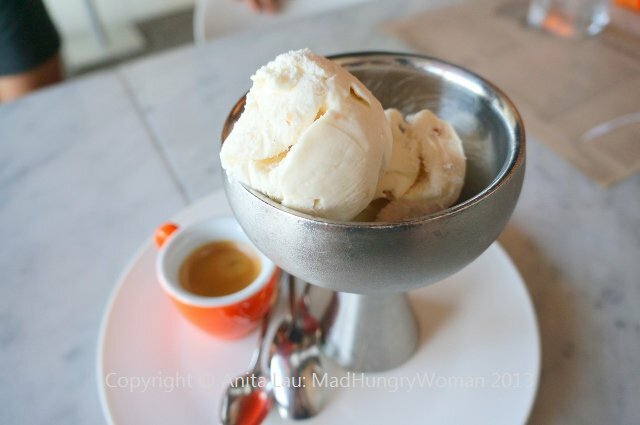 Two scoops of hazelnut gelato with a shot of espresso — I go mine decaf — was a perfect finish. Even my son was hooked! But that wasn’t all. When I heard they made the crunchy shell of the Cannoli ($7) in house, I needed to try it. 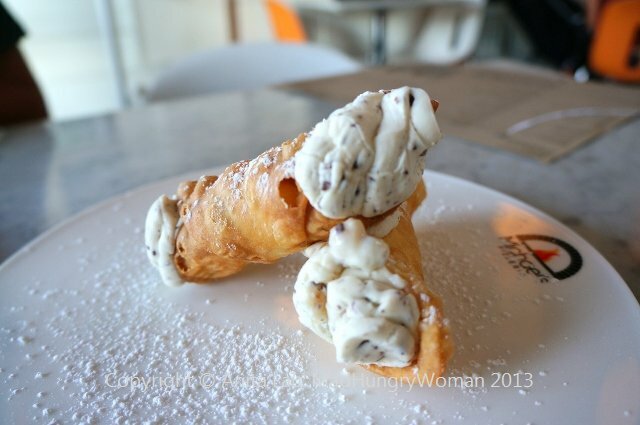 Filled with ricotta cream and chocolate chips, the only other cannoli I’ve ever had which tasted this good was in Italy! The shell was delicate and each bite just crumbled in my mouth. The filling had only a hint of sweetness which highly appealed to me! I’m looking forward to my next visit here. I’m not sure when I’ll be able to make it there, but you can bet both my son and I are anticipating it with bated breath! 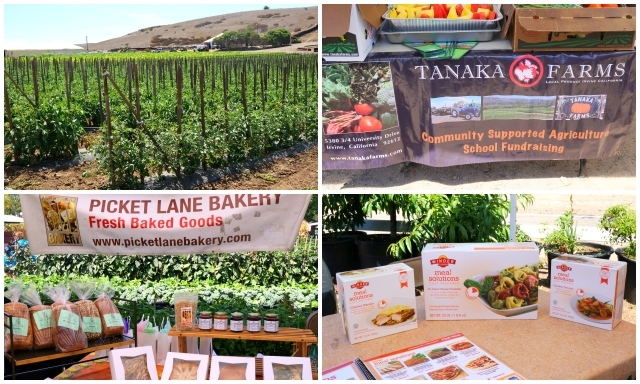 I recently visited Tanaka Farm for an event featuring Winder Farms, a premiere home delivery grocery company providing farm fresh food directly to customers’ doorsteps. The Winder Farms “farmers market on wheels” is ideal for those who are looking for farmers markets quality but don’t necessarily have time to go every week. The service delivers more than 300 all-natural products to customers’ doorsteps every week. It is a really simple process. 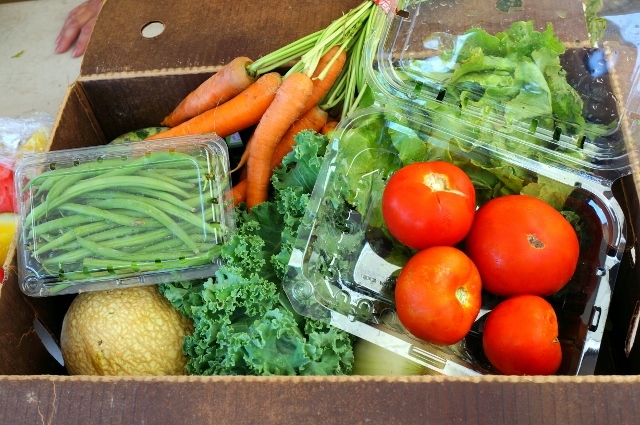 Customers can sign sign up with Winder Farms, order online, and open their front door in the morning to a Winder Farms cooler bag filled with farmer’s market quality fresh produce. Besides the produce, you can also order milk from Rock View, fresh bread from Picket Lane Bakery and there are also a variety of prepared foods you only have to heat up to eat. Right now until July 30, customers can use the promo code “OC Launch” on their first order and they will receive a $30 credit towards their next order. This week, one of my lucky winners will be able to win a $30 box of produce from Winder Farms! Leave me a comment with your FULL name and tell me why Winder Farms’ delivery service is something you will love to use for a chance to win. Entries close on Tuesday, July 23rd. Winner announced on Wednesday, July 24th. Good Luck! 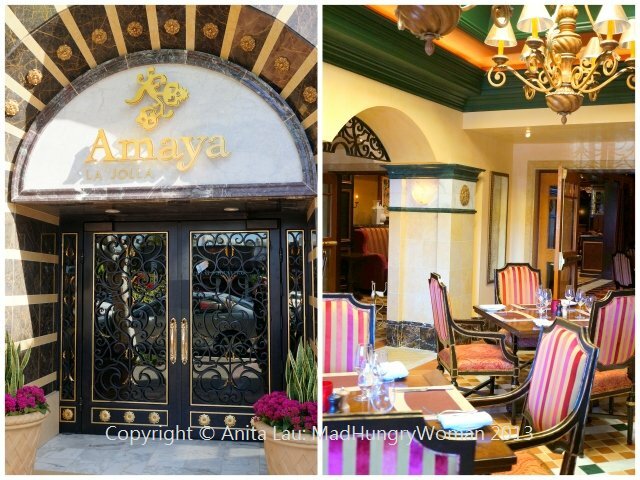 Being a huge fan of The Grand Del Mar Resort and its Addison restaurant, I was excited that Amaya at the resort opened a sister location in La Jolla. I was invited to dine with them and I brought my friend Vivienne along several weeks ago and found the restaurant very stylish! 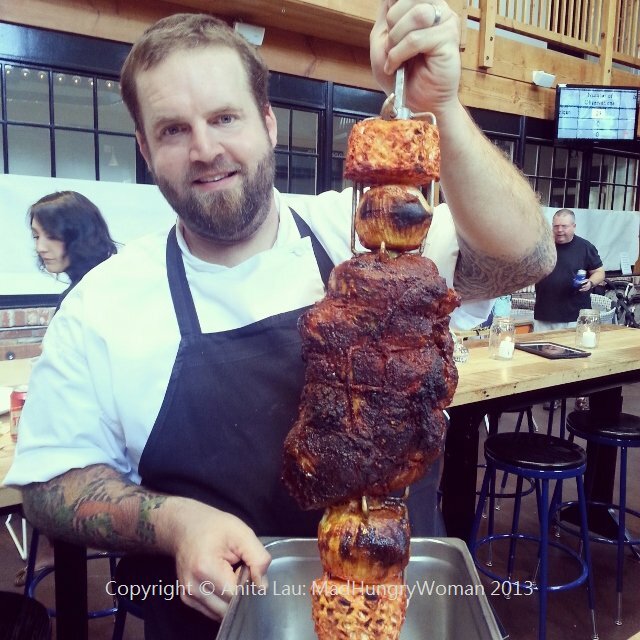 Chef Camron Woods serves American fare, but has included some of his Southern heritage into the menu. 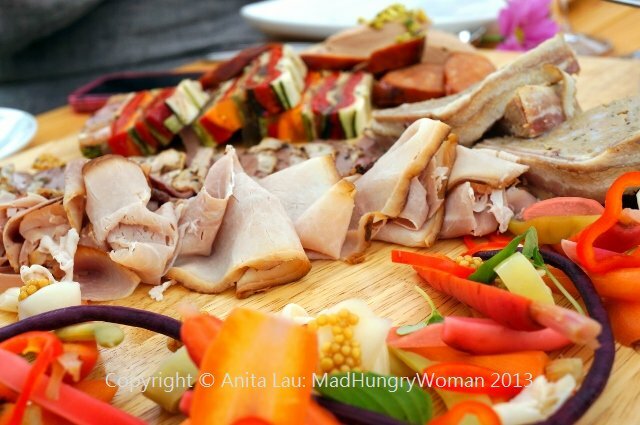 The food is contemporary and is perfect for business entertaining as well as lunch for visiting tourists. We were asked if we would like wine pairing with our meal, but since I’m not a big wine drinker, mixologist Andrew Adelson offered to do a cocktail pairing to go with our specially created tasting menu by Chef Woods. 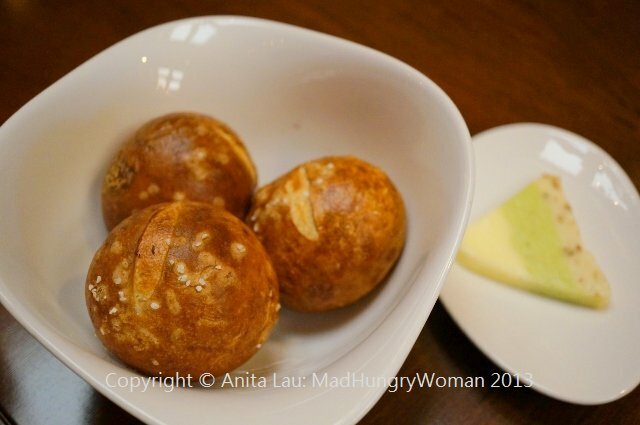 We started with some warm Pretzel Rolls with a Trio of Butters. Salted butter, garlic and herb, pecan honey were all wonderfully tasty, but my favorite was the pecan honey. Andrew brought our first cocktail Lavender Gin & Guava Press amethyst gin, guava puree, lime juice, simple syrup and soda was so refreshing and delicious Vivienne and I were struggling to stop sipping on it. 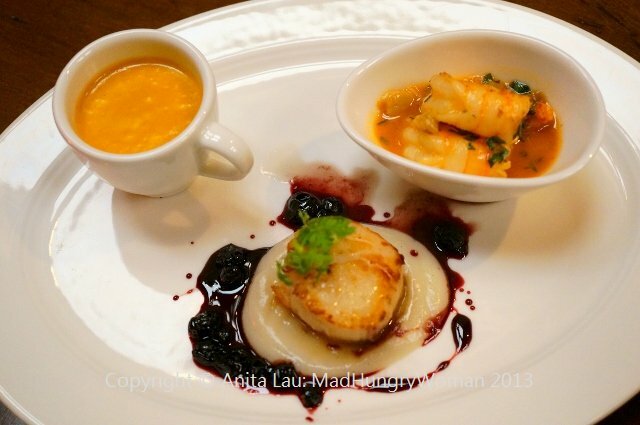 Our first course consisted of a tasting of three items (prices reflect a la carte portions). Crab and Lobster Bisque ($12) with tarragon creme fraiche was umami filled and the espresso cup size was hardly enough to satiate my longing for more. Day Boat Scallop and Beef Short Rib ($18) combined together a perfectly cooked scallop with fork-tender short rib. 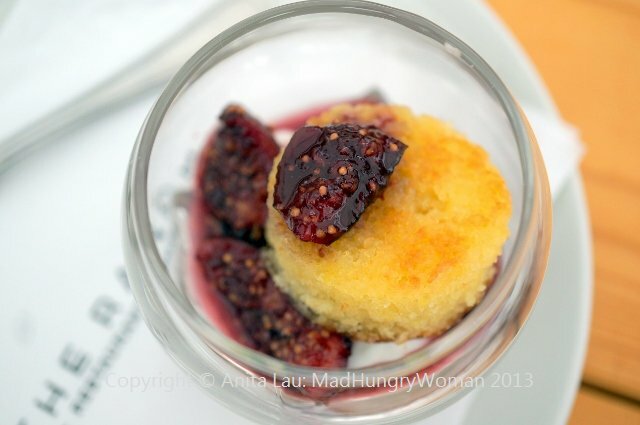 Vanilla-cauliflower puree was interesting while the huckleberry sauce added a touch of richness. 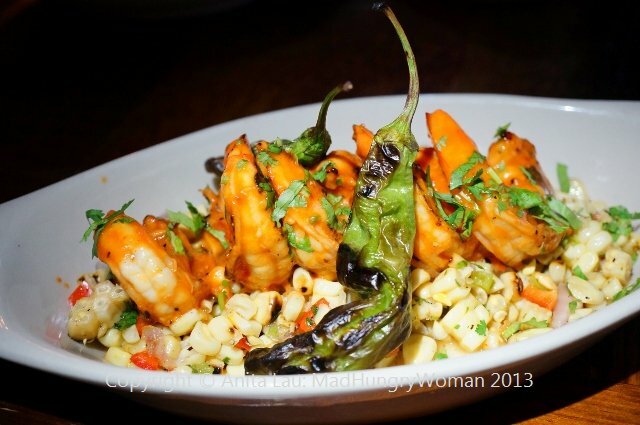 One of my favorites was Spicy Chile-Lime Shrimp ($15 full portion pictured). I loved the touch of spiciness and slight tartness of the sauce. The grilled bread was perfect to dip into the remaining sauce. I would’ve licked the bowl had I been home alone. Our second cocktail of Muddled Blackberry & Absinthe Margarita arrived. 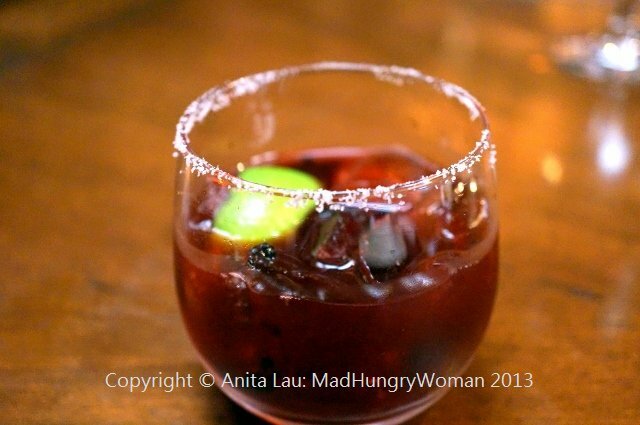 Herradura silver tequila, fresh muddled blackberries, orange bitters, Absinthe, lime juice on a salted rim. When Andrew brought it over and explained it, I was skeptical because I can’t stand absinthe. He explained that he only spritzed the cocktail with absinthe and begged for me to try it. I did and surprisingly, the absinthe didn’t overpower and I enjoyed the drink tremendously! Our second trio to taste consisted of Crispy Dorade ($32) confit fennel, tomatoes and nicoise olives, tangerine sauce, Duo of Sea Bass ($36) brandade and seared pave, pinot noir sauce and Duo of Beef ($38) grilled New York strip and braised short rib, crushed creme fraiche potatoes, broccolini. The crispy dorade (photo depicts full portion) was heavenly! The skin was super crispy while the flesh remained flaky and moist. 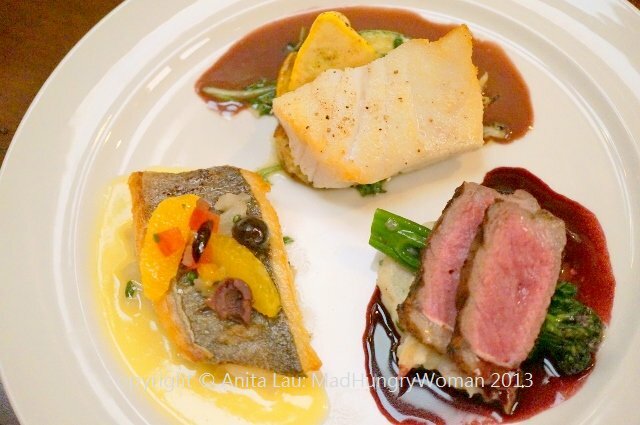 Duo of sea bass (photo depicts full portion) was more subtle and the fish melted in our mouths. 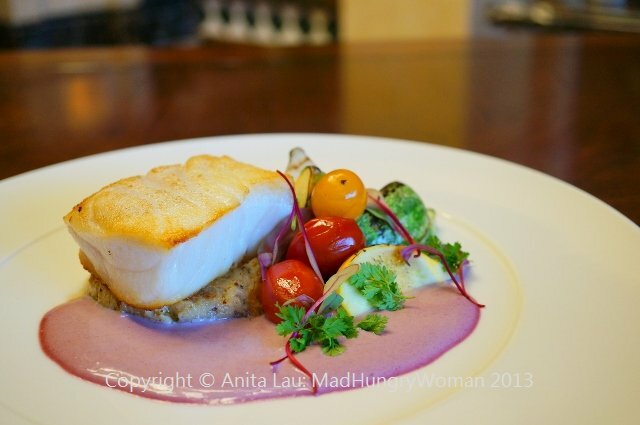 I wasn’t sure the pinot noir sauce would work with such a delicate fish, but it did! Grilled NY strip and braised short rib (photo depicts full portion) was served a perfect medium rare, and a meat lover’s dream! 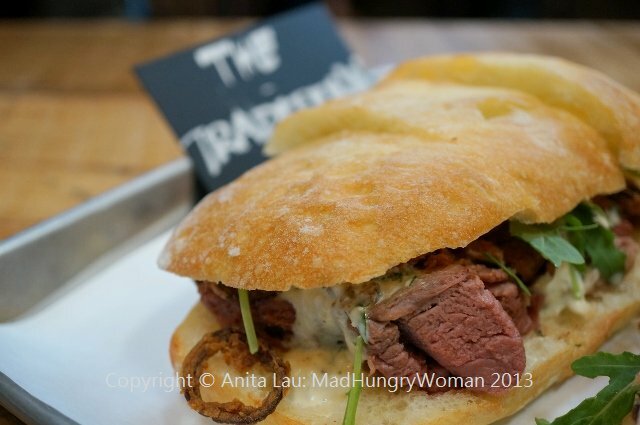 Tender and oh so decadent. Our last cocktail was a perfect pairing for our dessert trio. 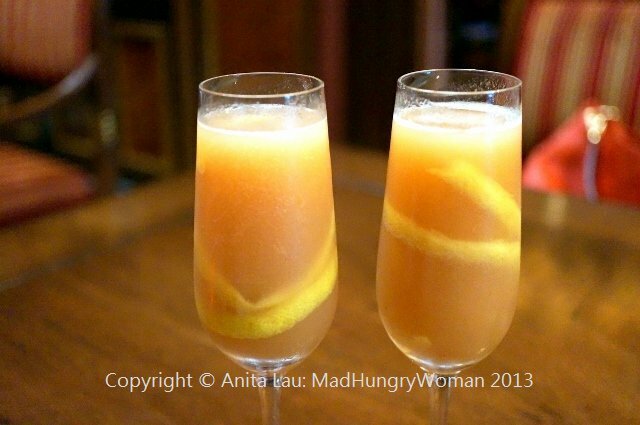 Angels Share Buffalo Trace was explained as Emilio Lustan, Palo Cortado, peach puree, lemon juice, twist of lemon around the inside of the glass. Don’t ask me what some of the items were because I have no idea, but it was Vivienne’s favorite! I think she drank my glass too (well to be fair, I drank her margarita!). 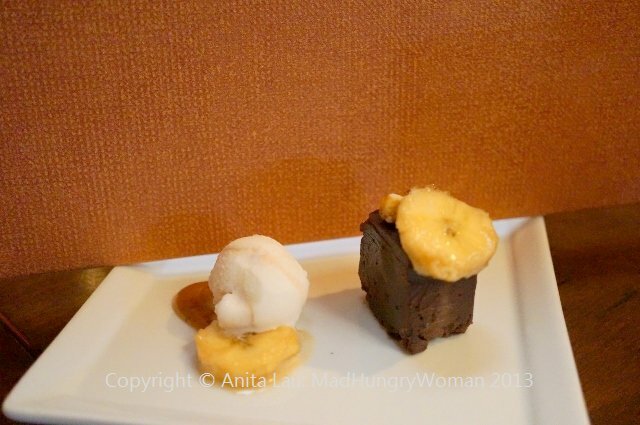 Chocolate Truffle Torte ($9) with black pepper caramel, hazelnut brittle, caramel-poached bananas and bananas foster ice cream is a chocolate lover’s delight. Rich, decadent with a really nice marriage of textures when you combine everything together in one bite. 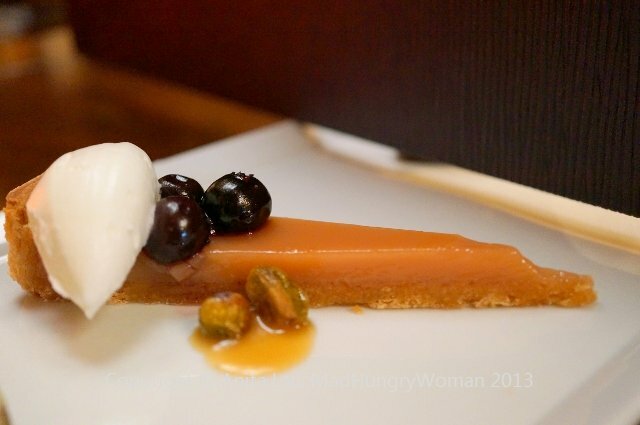 Blood Orange Tart ($9) was my favorite. It wasn’t too sweet on its own, but if you wanted it a little sweeter, add the caramel sauce, blueberry compote, candied pistachios and whipped creme fraiche with it onto your spoon and voila, there’s your lusciously sweet bite. 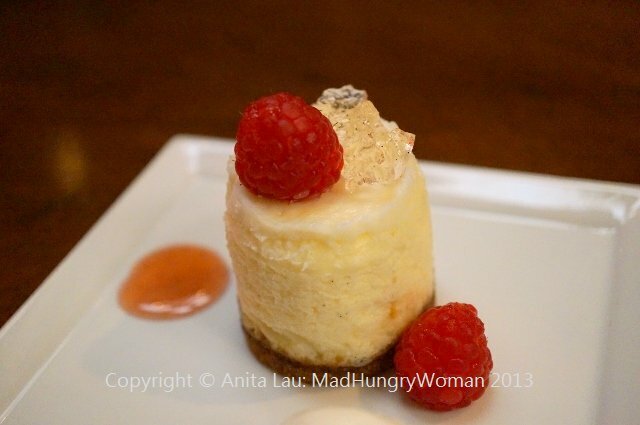 We received one portion of the Mini Cheesecake Trio ($9) — the vanilla portion of the trio. A white balsamic gastrique and raspberries accompanied. Amaya is not stuffy and you can walk into the restaurant in shorts and a T-shirt if you wanted to. 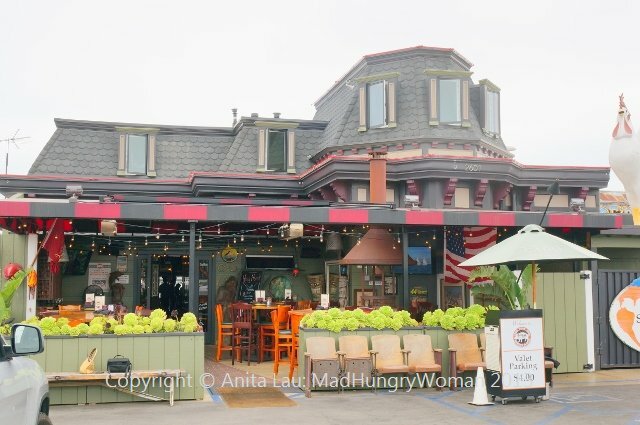 The food is top notch, classy and worthy of a five-star resort, but it is as casual as you want it to be but formal enough for a business luncheon.